Gone are the days when parking garages are supposed to look like staid buildings with brick veneer facades and punched windows, rather new trends in deck design include sculptural forms, new materials, and colored illumination all with the intent of transitioning decks from something to hide in the background, to something that is to be celebrated. Whether you drive an Escalade or are a committed public transit user everyone agrees that automobiles are a large part of the urban experience and are here to stay. It’s acknowledged by towns and private developers that successful commercial/mixed-use developments require convenient parking; however towns want something more than just functional parking decks with precast T’s and concrete spandrels that have blighted so many commercial districts. Towns are searching for solutions that fit contextually into their communities and are writing zoning regulations and design guidelines that promote just such enhanced solutions. 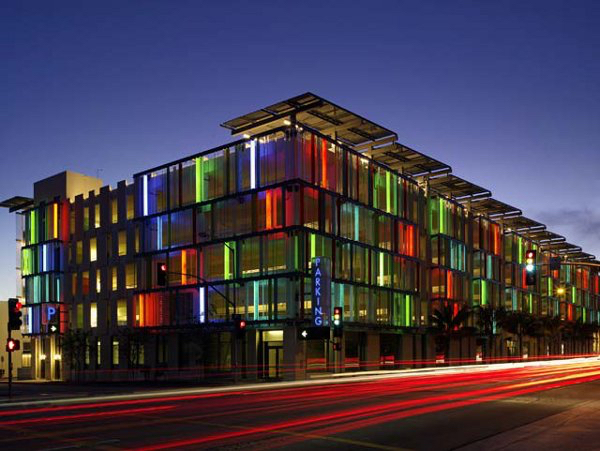 Cities such as Santa Monica are benefiting from this push towards higher design including the glass multicolored paneled facade above by the firm of Moore Ruble Yudell. And Miami is going further by actually directly commissioning starchitects such as Frank Gehry, Herzog & de Meuron and Zaha Hadid with explicit intent of creating car parks where “every building can be a work of art”, according to the mayor. The laser cut metal panel facade deck below is a recent addition to the Design District in Miami. Bottom Line: Parking Decks haven’t escaped the trend toward higher deign, they have become billboards of progressive designs enhancing the commercial districts of which they are part. And architects are seizing the opportunity to experiment with innovative materials such as laser cut panels, illuminated glass and kinetic metal panels that create stunning sculptures. These trends have been noticed by the movie and fashion industries who are utilizing the decks as back drops for their projects and the public at large have noticed and are renting out these spaces for parties and even brides have held wedding receptions in a deck with stunning views of the Miami skyline. Strong design has transitioned decks from being eyesores to visually tantalizing piece of the urban fabric.